I've scanned and uploaded new Lee acquisitions to the Lee Seung-Yeop page. I am in the process of adding more cards to the PC using Buyee, KubeTEN and Noppin. 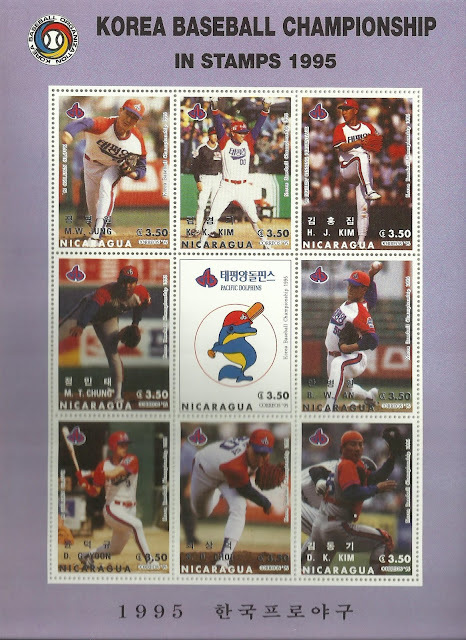 I bought these on ebay last year for about $35USD and they appear readily available. These would look cleaner but my scanner needs to be replaced. 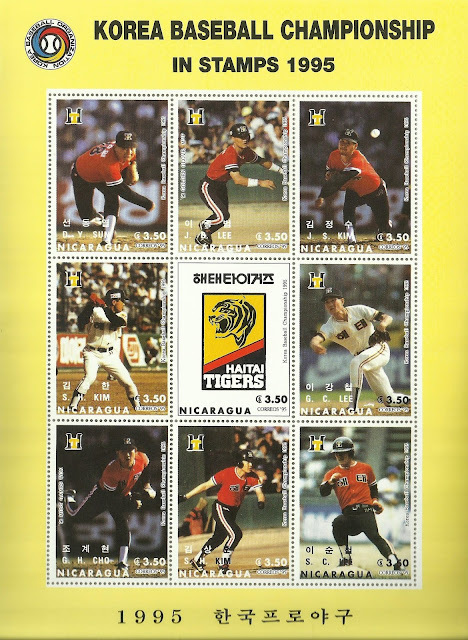 These were released by Correos of Nicaragua in 1995. 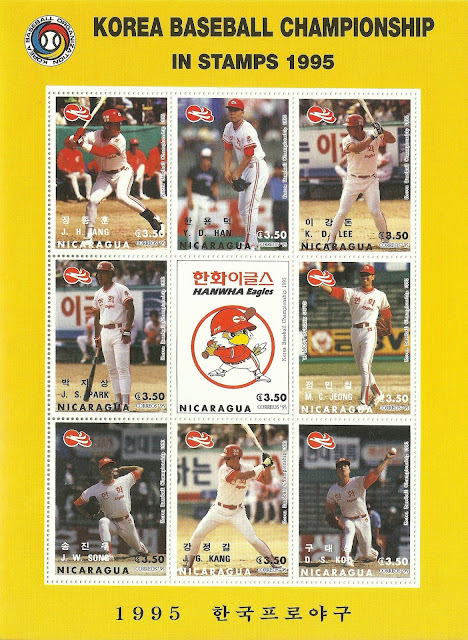 All eight teams of the KBO in '95 make up this stamp set with 9 stamps per team (8 players, 1 mascot). 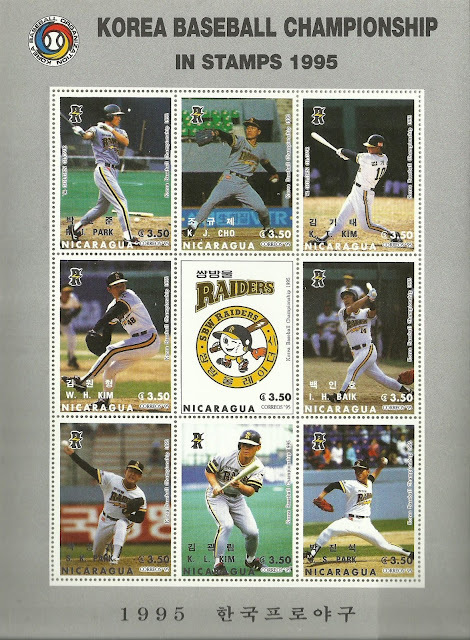 For each team, players make up the outside border and the mascot is in the middle. 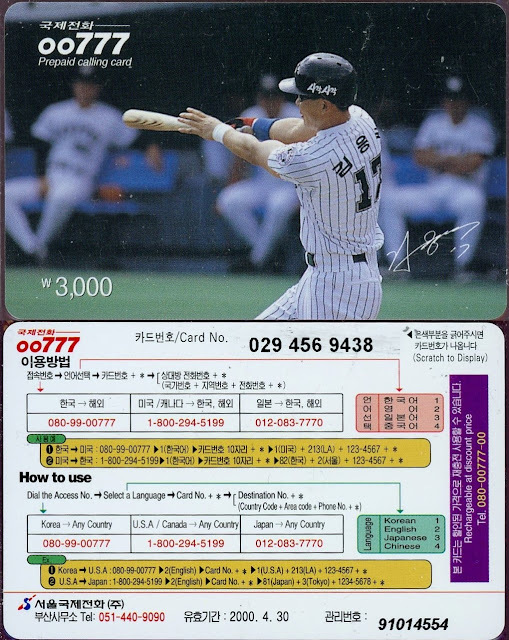 The players name is in full Korean as well as the family name and first two initials in English. At the time of this post I have forgotten to scan the back. I will include one later. 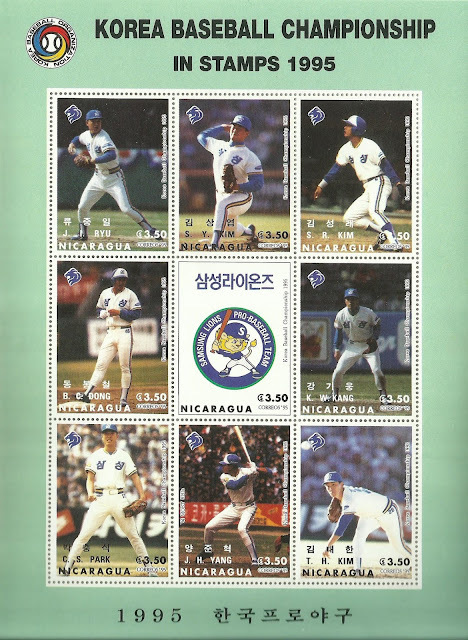 On the bottom of the sheet it says in Korean, Korea Pro Baseball (한국프로야구). The photos are of games played in Korea, during the season I'd assume. 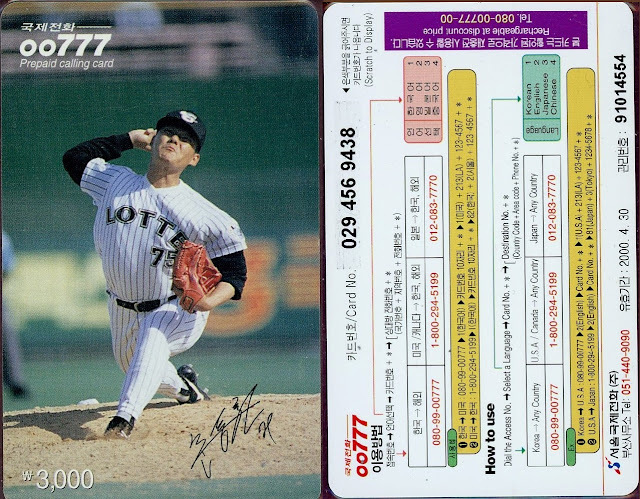 I may consider breaking up a team set to get a player graded by PSA (maybe Jong-Beom Lee, Min-Tae Chung or Ki-Tae Kim). 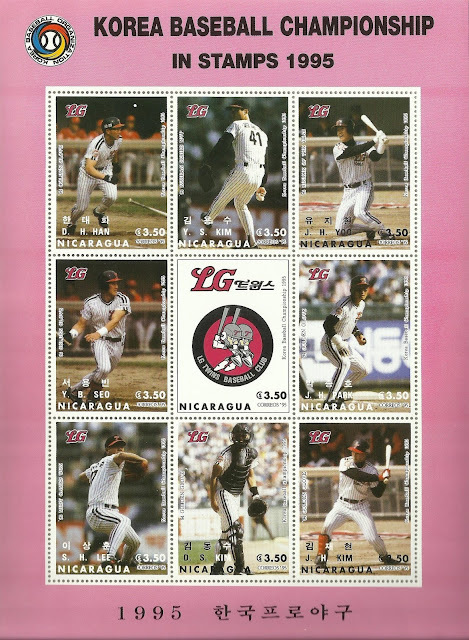 I have a Mattingly Grenada stamp graded so hopefully they will grade these as well. 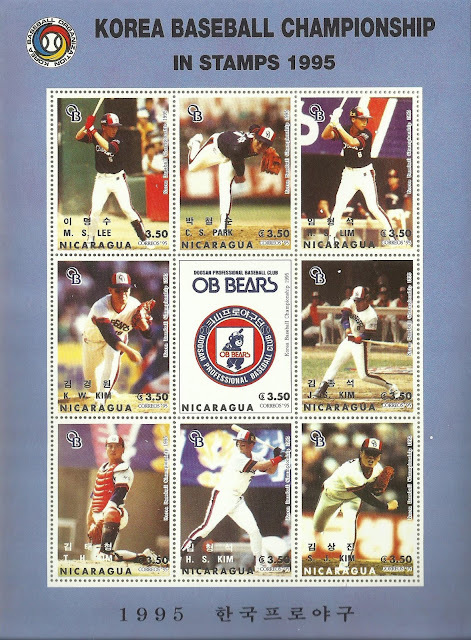 I will even see if I can add this to TCDB but I have a feeling it's not allowed since these are stamps. 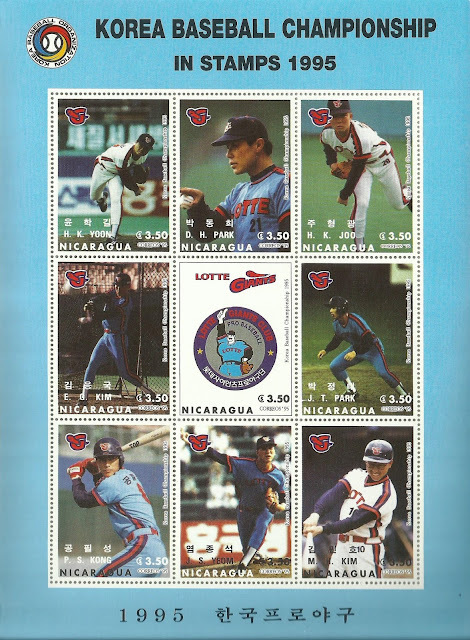 I added the checklist for this stamp set to TCDB located here. It is listed under Oddball (as is the Grenada), not Korean League. 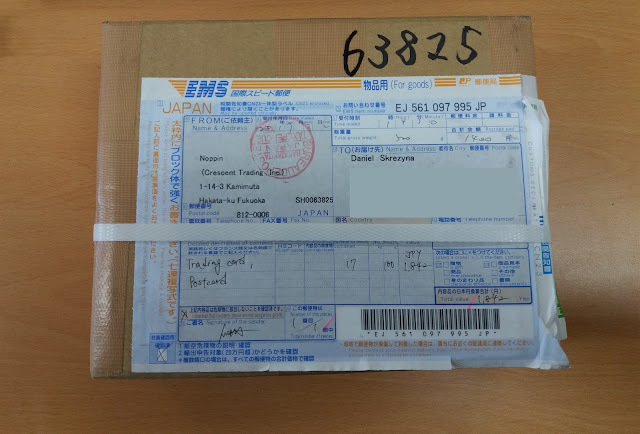 I just received my first order of Japanese cards from Noppin (dba Crescent Trading), a Japanese "middle man" company who places your bids and ships to you. I think you would need a Japanese Yahoo! Auction account which I don't think non-Japanese can get, otherwise I would attempt this myself. When using this site, and others like KuboTEN, who I am awaiting an order from, they charge you 1000JPY (~$10) per seller you buy from. 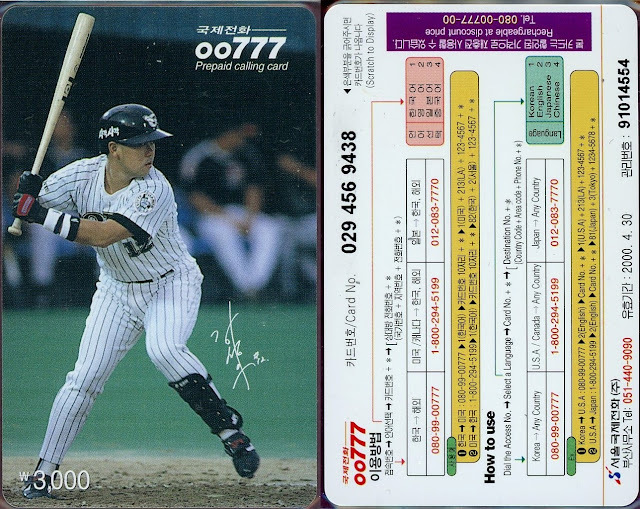 So if you want seven cards from seven different sellers, you are paying $70 off the bat. The good things is that they will hold all your packages and ship them all at once so you can save on shipping. These sites require you to deposit money ahead of time to bid on items, similar to COMC, and I use PayPal. Since they are in Japan, they charge you JPY (Japanese Yen) which is less than the U.S. dollar at the moment so I make a little more on the exchange; unlike my more important monthly exchange from Korean Won to US dollars. 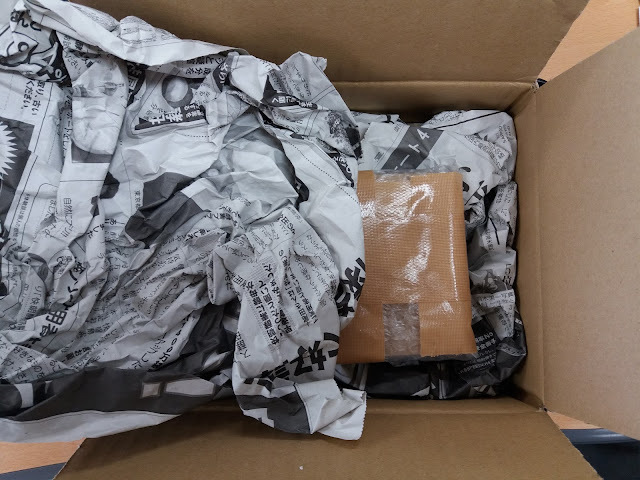 I decided to take photos of the packaging received from Noppin. 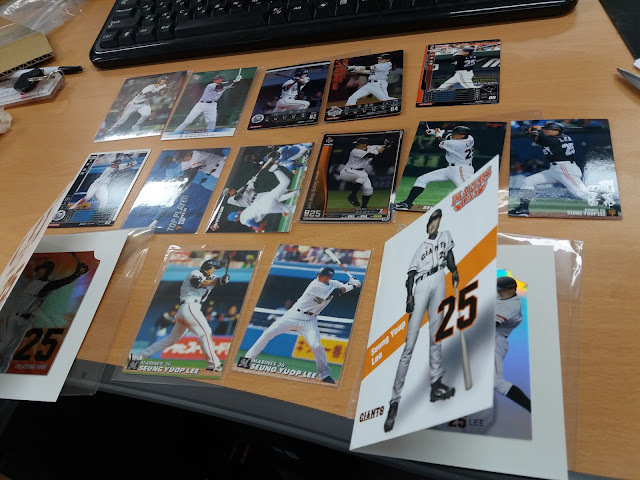 I ordered 17 different Seung-Yeop Lee (이승엽) cards from different sellers. Keep in mind, you have to go by the pictures unless you can read Japanese, which I can not, though I use bad Google translator for assistance. 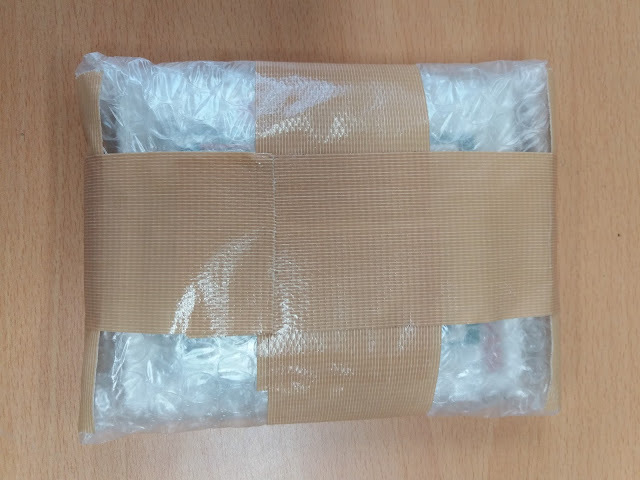 The auction sites also use the translator so you don't have to cut and paste everything to a translator, but it may not always give you what you need. I decided to pay the $14 to ship via EMS instead of Air Mail. 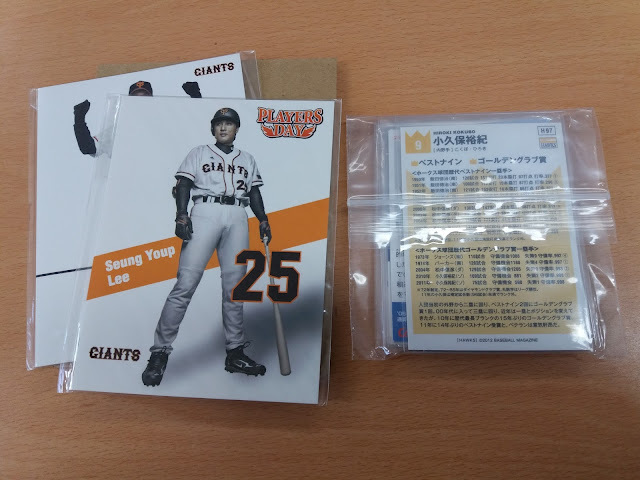 In this order, I received two Yomiuri Playing Day cards of Lee with the Giants which are packaged inside a Giants postcard, some Calbee, BBM and Konami. I did read on one of the auctions that it said the card was dirty, but it was cheap so I bought it anyway. Upon closer inspection, the holographic card has surface smudges that can't be removed so I probably won't submit it to PSA but will look for a new copy. 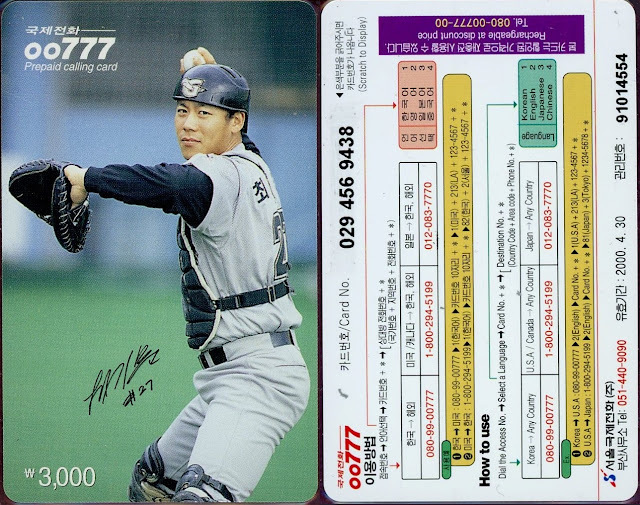 With the help of Dave over at Japanese Baseball Cards, who also collects Korean cards, he pointed me in the direction to pick up my first phone cards. I just started looking at these closely and will try to find out which company released these. 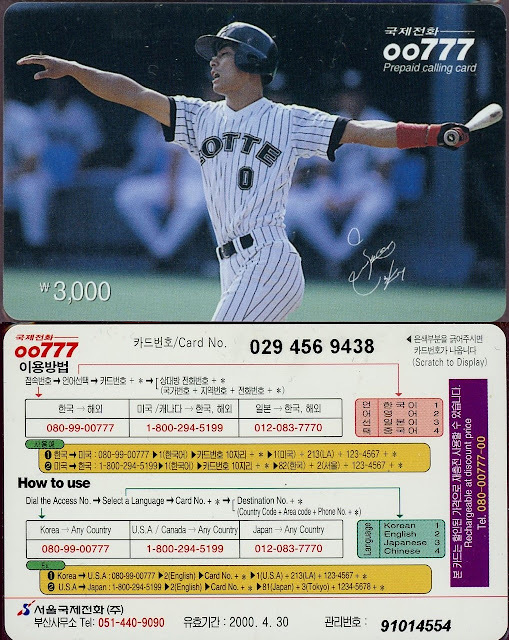 I'm leaning towards calling these "Seoul International Phone Call" because it's in bold on the back with a logo. These are super unique and I'm very happy to have these now. I appreciate Dave giving me a heads up. 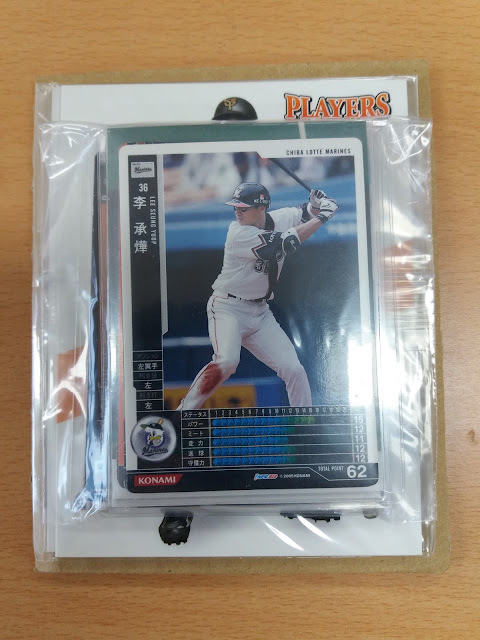 I'm not sure when these were released, if these only came in Lotte Giants players, or how many there are. 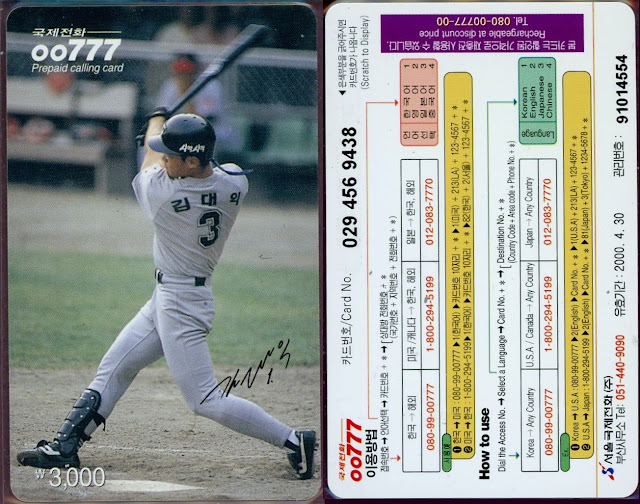 There are no names listed on the cards, only the player photo and a facsimile auto. 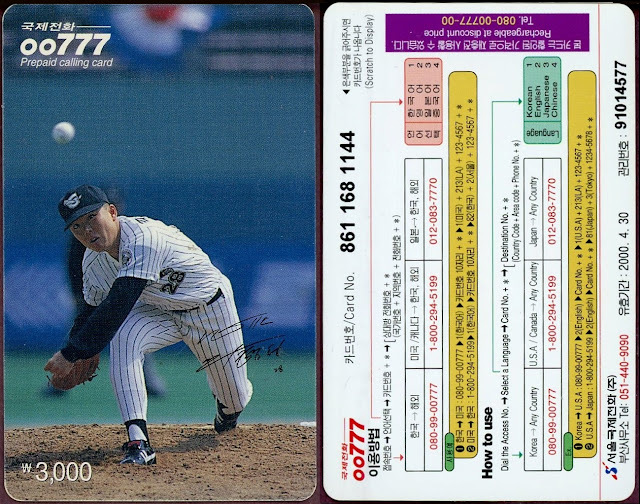 The expiration date for these cards was 4/30/2000 so I wouldn't be surprised if these were released in 1999. I used my 1999 and 2000 Teleca set uploads at Trading Card Database to identify the players. I bought a box of each Baseball Best Players and tried to hit some of the inserts I needed to complete the sets.